Bossa Studios has released a brief bit of new gameplay footage taken from Worlds Adrift, the physics-based multiplayer game it announced late last year. It's still quite rough, as you'd expect at this early stage, but surprisingly beautiful too, and Bossa sounds far more deeply committed to the project now than it did back in December. 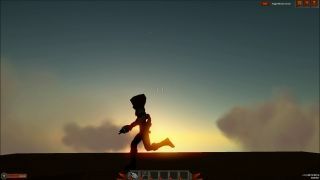 The video focuses primarily on the "atmosphere" in Worlds Adrift, generated by its distinctive visual style, soft dynamic lighting, and impressive-looking day/night cycle, and the multitool used to perform tasks including harvesting, repairing, and most crafting. It also shows off the craftable crossbow, which fires projectiles that behave like "real," physics-based objects. Bossa's previous projects include Surgeon Simulator 2013 and I Am Bread, which may not make it the most obvious candidate for developing this kind of game. What makes the prospect both plausible and intriguing is its partnership with Improbable, a privately-funded technology company that seeks to "enable new experiences by unlocking the power of distributed, real-time, persistent simulations." In an interview last year with GamesIndustry, CEO Herman Narula said Improbable "can take an online game, make it much cheaper, much better, open to a lot more users, and offer a whole new kind of experience." He described Bossa, its first game development partner, as "phenomenally talented," adding, "The only thing holding back [its] big ambition is technology. We're hoping we can solve that problem for them and just get out of their way and let them build the incredible game they want to build." As a fully physics-based, open-world multiplayer game with extensive harvesting and crafting, Worlds Adrift is most definitely ambitious. But while the studio sounded somewhat iffy on the project when it was first revealed, asking followers to tell it "if you think it is worth [it] for us to continue working on this game or not," it now appears fully committed: There's now a Worlds Adrift YouTube channel, although Bossa hasn't yet moved any videos to it, and a "feedback wall" where fans can offer ideas and vote on development priorities.